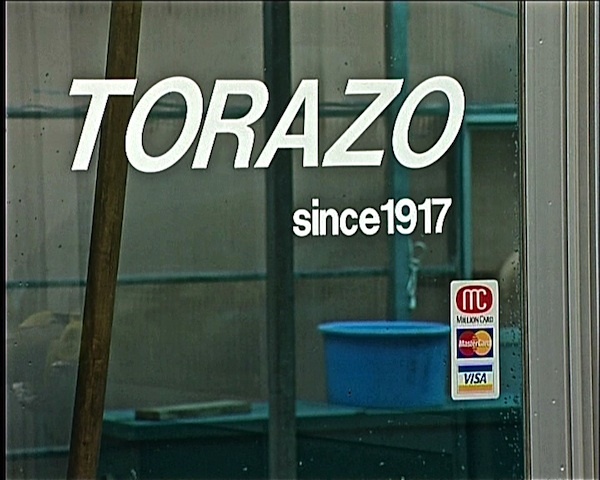 No doubt the nickname ‘Torazo’ came about in the early days and it stuck forever, but after a decade or so, every breeder in Japan had parent Koi with the Torazo stripes. And all these breeders were able to produce Torazo Sanke! Most also had parent Koi from the early Jinbei Sanke lines but it was almost impossible to get either of these lines of offspring to exceed 65cms. In their days the Torazo Sanke were the finest in the world and the Jinbei lines were running neck and neck with them. It’s a fact that the only Jinbei Sanke I have ever purchased was found at SFF in Hiroshima, I never purchased any from the Watanabe family in Araya. As far as I have been told, the last serious attempts to breed Torazo Sanke at the Torazo farm was in 1973 and in 1974 the Watanabe (Jinbei) family ceased production of their Jinbei lines although Izumiya still uses the descendents of them today. I have been told there were two main reasons for this, the obvious one was maximum size achieved and the other was the new ‘Sanke Kid’ on the block of the day namely Matsunosuke. Not only were Matsunosuke Sanke much more desirable with the collectors but in later years some of these could and did touch the magical 70cms size before they too stopped growing. In autumn around the entire 1980’s, when Japanese dealers and enthusiasts were visiting Yamakoshi in their droves, the ground floor of the Torazo home was used as a place they could crash out there every night together with liberal quantities of alcohol rather than have to incur hotel costs. Hiroshi had no problem in allowing these guys to find and purchase Koi from other breeders and store them in his outdoor ponds until it was time to return to their own home bases. I do hope I can get this next part over properly; it’s not so easy to explain but it was bloody funny at the time! Some of these visitors commanded great respect in the Japanese Koi world of the day but that never seemed to impress Hiroshi Kawakami even one jot. I can’t recall how many times I’ve seen these visitors returning to Torazo after a full day’s Koi hunting in the mountains with many vinyl bags containing their precious purchases. I witnessed the excitement in their eyes as they placed the bags on the pond surface and stared at the Koi inside them whilst Hiroshi and his wife attended to their bonsai. Of course, these guys could never contain their excitement all to themselves and sooner or later they would turn to Hiroshi to share the same excitement with them. Hiroshi was one of the most famous Koi breeders in the world back then and these guys were sharing his home and also buying Koi from him. They would come home in the late afternoon with their purchases and foolishly ask Hiroshi his opinions. If the truth was known these guys NEEDED his blessings to confirm to themselves that their ‘Koi eyes were on song’. I can’t recall times when Hiroshi did not have a wooden toothpick protruding from his mouth and I’ve watched his face as he looked at these new purchases and he’d twiddle the toothpick trying his best to look very serious indeed. He’d give a few short words to the guys such as ‘How much did it cost’? and ‘Really’? – before turning away with this wry half-smile that said ‘Why on earth did you buy THAT thing’! He never once uttered a single word of criticism of any Koi but the wry half-smile was the killer – I’ve seen many dejected faces in my life but few that ever compared to those! The very best personal experience I’ve had regarding ‘Utter Dejection a la Hiroshi’ was when one guy came back with a bag containing three tiny tosai Kumonryu and started showing them off to anyone he could. Hiroshi gazed inside the bag for a second and then walked back to the house, he returned seconds later with one of his fishing rods all tackled up and handed it to the guy after first pointing out the stream behind the house. ‘Why pay good money for ‘em? You can catch MUCH better ones with this for FREE’! Memory and guesswork kicks in now, but I think it was around ’93? that Tsuyoshi married. I had met his wife some time before as her family owned a flower store in Ojiya and there were times I needed to buy flowers as presents for various occasions. When she moved into the Torazo house, her new duties were to assist her husband in the Koi business. By the mid 1990’s there was no doubt as to who was in charge of Torazo. 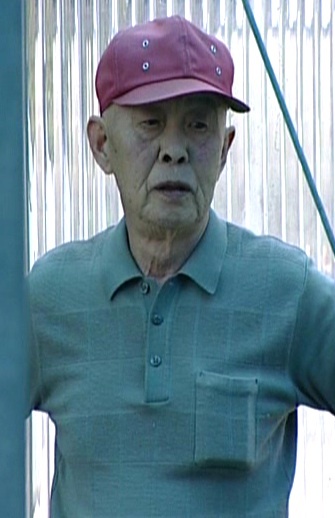 Both Hiroshi and Tsuyoshi staffed the farm but Tsuyoshi had definitely taken the helm. 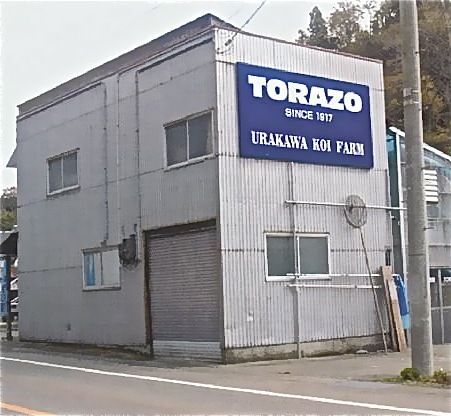 When I visited Torazo, in the years from ’77 to ’92, I could find Go Sanke in equal quantities plus Kujaku and other metallic varieties all produced at the farm by Hiroshi. Within three or four seasons after Tsuyoshi had taken charge, the majority of Koi seen there were Kohaku. Since then the Sanke outlet has become a dedicated Kohaku outlet. There is no doubt that Tsuyoshi has a very acute ‘eye’ as to being able to ‘see’ fine Nishikigoi, here is just one example of his ability. In 1998, the All-Japan Champion was the beautiful ‘Kamiya Kohaku’. Before this Koi had been seen and purchased by Ryo Kamiya, she had also passed through the ownership of Hiroi Seiji and a well-known Tokyo amateur. 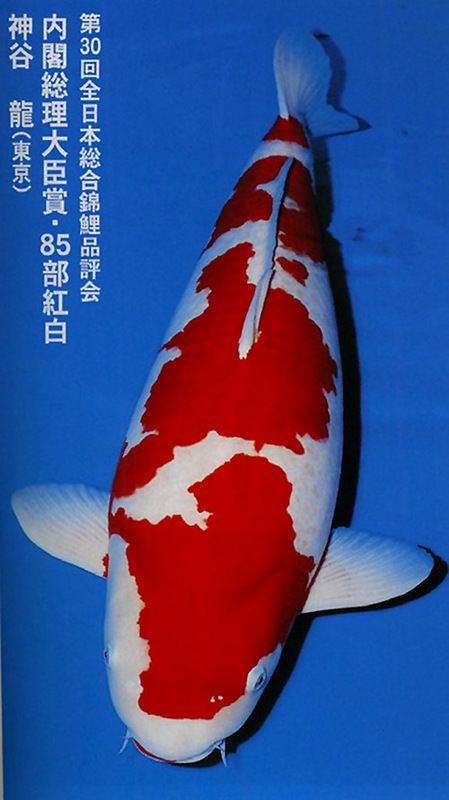 The Murata Company in Chiba had produced the actual Koi, but it was Tsuyoshi’s eyes that found her there on sale at nisai and he purchased her for a significant sum as his tategoi in order to grow her in Yamakoshi. Around 1999 there were significant changes taking place in Yamakoshi when the visitors from other parts of Japan reduced in numbers but enthusiasts and dealers from abroad increased in numbers. Whilst the breeders themselves saw the changes that were taking place around them they did precious little to capitalise on the situation. The meeting I held with them in 2001 mentioned the need for Koi signs in English and the necessity to pick up a few words of English. It seemed to have an effect on them and Tsuyoshi was one of the first to implement these changes at Torazo. Not only did he have signs made in English, he also his own had hand written signs for his tosai house that read like this one. In 2002 he did what no other breeder would ever consider in those days by having hand written signs next to the display ponds reading ‘Male 2yrs’ followed by the price and ‘Female 2yrs’ also followed by the price. I have never really been able to fully understand the ‘1917’ date on the door. Only a couple of miles away is Izumiya who proudly states that his outlet was the first Koi outlet in Japan which opened its doors in 1947 directly after WW2? 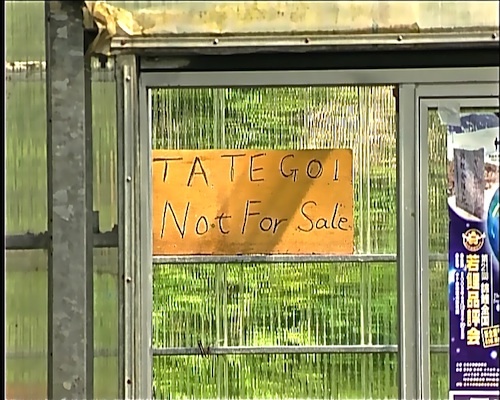 I would think it much more likely that the forefathers of the Kawakami family first started experimenting with coloured carp in 1917 as a private hobby, the likelihood of anyone visiting the area to purchase them at that time is not even remotely worth considering. As to when the Kawakami family actually first started ‘trading’ in Koi, I suspect it would be a few years after Izumiya? I really think my mentor Hiroshi would have lived forever had it not been for a particularly horrendous road accident in Ojiya during 2004. The emergency teams managed to cut him out of the wreckage and get him to the hospital nearby but Hiroshi died only a few hours later as a result of multiple injuries. I passed my condolences to Tsuyoshi later that year and I think perhaps he may have understood my reasons? I’ll never, ever understand why a lad from Yorkshire, later addicted to Koi, managed to become associated with some of the finest Koi teachers in the world – but he did. Hiroshi was one of my teachers. It’s not always wise to dwell on sadness; it’s best I remember Hiroshi as one of the kindest and wisest human beings I have ever had the honour to meet.